UC Santa Cruz graduate Tim Galarneau, now a food systems researcher at the Center for Agroecology and Sustainable Food Systems, leads a World Café-style brainstorming session at the Stevenson Event Center. The seventh national SAEA conference drew a record number of participants from across the U.S. and as far away as Brazil and Sweden. 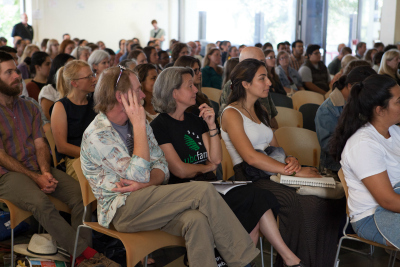 With growing numbers of students and educators interested in sustainable agriculture, food justice, and experiential education, the Sustainable Agriculture Education Association (SAEA) conference held July 29–31 at UC Santa Cruz highlighted hands-on educational efforts that bridge scientific and social issues. The seventh national SAEA conference drew a record number of participants from across the U.S. and as far away as Brazil and Sweden. More than 350 students, faculty, staff, farmers, chefs, and community group members gathered for three days of workshops, panel discussions, presentations, and World Café-style brainstorming sessions centered on “The Ecology of Food Systems: Engaging Interdisciplinary and Applied Education for a Just and Sustainable Agriculture.” The conference was hosted by UC Santa Cruz’s Center for Agroecology & Sustainable Food Systems (CASFS) with major support from the UC Global Food Initiative. 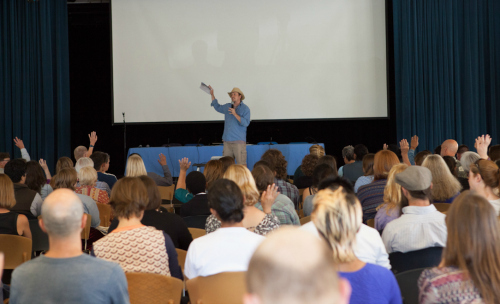 The conference theme reflects an increased interest in food system and food justice topics that go beyond the environmental and biophysical aspects of sustainable agriculture. “There’s a huge focus on inequities in food systems today, and on bringing social justice topics into the classroom,” says Stacy Philpott, professor of environmental studies at UCSC. More and more colleges and universities are developing campus farms and gardens, sustainable agriculture degree programs, and food system majors—often in response to student demand for experiential, in-depth learning opportunities about agriculture and the larger food system. Conference presenters shared experiences in developing interdisciplinary opportunities. Saskia Cornes, who runs the Duke Campus Farm in Durham, N.C., described her efforts to connect students with the social history of the land they’re farming, using the tobacco, cotton, and indigo grown on the farm to generate discussions not only of agronomy but of the complex social history surrounding those crops. She also sees the farm as a way to give students a place to develop “reparative relationships” with the land that may help overcome a sense of despair in the face of current environmental and social challenges. 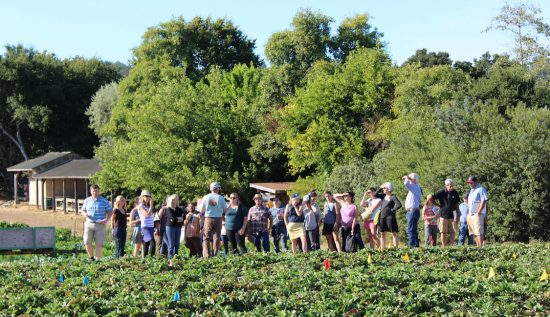 Christof Bernau and Kellee Matsushita of CASFS led a workshop on how they integrate food justice topics into their work with students and apprentices at the UCSC Farm. “For example when we’re talking about plant families it’s a chance to infuse some social history—who were the first cultivators, why were these crops important as cultural resource, and how have issues such as colonialism affected how those crops are used now?” Bernau said. Other workshops emphasized the types of practical, experiential skills that students often seek on campus farms and gardens, and how to address the challenges of teaching those skills. Much of that future has been seeded by graduates of the CASFS Apprenticeship in Ecological Horticulture and other UCSC programs, which were well represented throughout the conference. A number of Apprenticeship graduates presented work on the educational programs they’ve started since graduating: Albie Miles, an assistant professor at the University of Hawaii, is developing UH’s campus farm and sustainable community food systems program. Parr helped create many of the experiential education opportunities for undergraduates at the CASFS Farm and Garden. Patrick Archie gave a tour of Stanford’s new O’Donahue Family Educational Farm, which he manages, and Jered Lawson and Nancy Vail hosted conference participants at their Pie Ranch educational farm in Pescadero. Guy Kilpatric and Meredith Epstein shared the programming work they’ve developed at the University of Maryland’s new Terp Farm. UCSC graduate Kevin Cody talked about the challenges of creating an organic farm at the University of Northern Colorado on a site ringed by conventional agriculture and fracking operations, and how their efforts can address food security issues in the local community. Education programs and food justice efforts also extend to the larger campus food system, where students have led campaigns to push for more sustainable food in the campus dining halls. UCSC graduate Tim Galarneau, now a food systems researcher at CASFS, has spearheaded these efforts within the UC system and beyond, working with students, staff, faculty and administrators to boost the amount of local, organic, sustainably produced food purchased by campus dining programs and create learning opportunities for students interested in how they can help improve the food system. This year’s SAEA conference marks 10 years since the sustainable agriculture educators’ first gathering at the Asilomar Conference Center in Pacific Grove that gave rise to the national organization. Then a CASFS staff member, Miles helped organized that first meeting, along with Parr, and Mark Van Horn, director of UC Davis’s Student Farm. Miles recalls, “We had been doing local meetings of agricultural educators in California, supported by a Kellogg grant. It soon became clear that there was a national trend taking place and a need to convene academics and practitioners to share best practices when it comes to experiential and hands-on learning in sustainable agriculture.” Out of that 2006 gathering came the idea for the Sustainable Agriculture Education Association (http://sustainableaged.org/), which today serves and connects educators, staff, students, and administrators teaching sustainable agriculture, and champions innovative educational approaches. The SAEAE conference was co-hosted by UC Davis, UC Berkeley, UH West O’ahu, Cal Poly SLO, ALBA, Merritt College, and Stanford University.